How to recover lost Mac partition? Partition means the division of a computer's processors, memory, and storage into multiple sets of resources so that each set of resources can be operated independently with its own operating system instance and applications. The number of logical partitions depends on the model and size of the Hard Disks. Through logical partitions hard disks can be divided into several parts. But these Partitions may get lost, missed or corrupt due to some common reasons like hard drive crash, uncertain system shutdown, viral attacks, power surge, software corruption, file system corruption. Due to partition loss, important data stored on those partitions may become inaccessible which may create many hardships to the persons who are depending on those data. When huge blocks of data are lost due to partition damage how do we then recover the information and restore full capability to our hard drive? Is a lost HFS+ partition recoverable? Yes, a lost HFS+ partition can be recovered along with the important data, provided if it is not overwritten by creation of a new partition. Lost partitions can be easily recovered using partition recovery software. To recover lost Mac partitions we recommend AppleXsoft File Recovery for Mac. which can not only restore lost partitions but also recover lost files from lost or missing, deleted, formatted HFS+ Partitions of Mac Operating system. Do not format the drive or re-partition it. Do not write anything to the drive containing lost partitions. If the partition containing the Operating system is lost, remove the hard drive from the computer and connect it as a secondary drive and trial run Applexsoft File Recovery Software from the host operating system to recover the lost partition. On the other hand if any other partition containing the file is lost, you can install the software on another healthy partition and perform the file recovery. 1. Start AppleXsoft File Recovery for Mac and Select the physical disk from the list by disk and partition. 2. Choose Lost volumes scan for recovering lost volumes. Lost volume scan allows you to recover disk partitions that have disappeared or fail to mount. File Recovery will display a list of partition names and you can then recover them. 3. 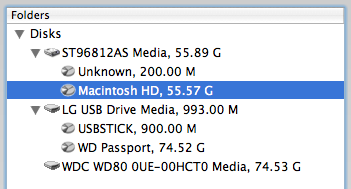 As the scan progresses, you will see lost partition or volume names show in the list. Lost partitions are indicated by a green icon. 4. Select the partition or files you wish to recover. Download AppleXsoft File Recovery for Mac now and recover your Mac partition! Recover Deleted Photos from Memory Card on Mac OS X ? How to recover SanDisk files with SanDisk Data Recovery? How to Recover data from Ghost hard disk drives by error? How to recover files from EXT2/EXT3 Drive? How do I recover lost files and folders? How to Recover Deleted Email files? How do I recover files from Raw Hard Drive? How do I Recover deleted, missing or lost Logical Drives? How do I recover lost files from re-partitioned hard drive(s)? How do I recover hard disks involving Scandisk and Chkdsk error? Recover Encrypted file on NTFS Drive? Recover Compressed files on NTFS Drive? recover files from dynamic-disk in Windows?